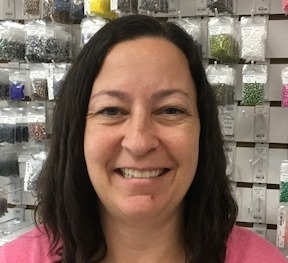 Michelle Hall was bit by the crafting bug at a very early age while observing her mother sewing clothes for family members, friends, and clients. The observations prompted her to begin designing and hand making clothes for her Barbie dolls by second grade. The love of crafting grew with every year and eventually became “Crafting ADHD” with many projects in various stages of completion and designing scattered about her craft room. Jewelry projects and designs in the craft room include, but are not limited to, bead weaving, dichroic glass, Kumihimo, loom work, macramé, stringing, wire wrapping, chainmaille, and lamp work. Michelle encourages everyone to come to the store or view the online class calendar to see how the crafting bug influences each of the instructors’ designs.